If you’re a travel writer, this is a topic that often comes up. Will you take a sponsored press trip, a trip that is planned for you and/or a group of other writers, so that you can see places you may not be able to afford to go? Or, do you go it alone, rebuffing PR offers in order to maintain your objectivity or, at least, to stay in the good graces of publications like the New York Times, which blacklists – at least temporarily – those writers who have taken them? Being sponsored is murky territory in the travel writing domain. It is the crux of discussions over travel writing ethics, conversations which seem to come up every time there is a conspicuous travel blogger hashtag campaign on Twitter. Sponsorship in travel writing – that is, having a trip partially- or fully- funded by a third party – is a grey area because many of those who write about travel cannot afford to work otherwise. As I read both of these articles, I couldn’t help but think there is a third reality. It is my reality. And in the interest of full disclosure, I will reveal the circumstances that allow me to write and publish. I began my writing career by chance, not out of some deep calling. In 1998, I started writing articles and short guides for digital travel publishers that needed original content. It was a side hustle but one that fulfilled my young wanderlust. I went on a few press trips at the time. I got the itch to travel more. And, to my surprise, I found that I enjoyed writing and that my employers liked what I wrote. Life was good, but the pay wasn’t great. Over the next several years, I followed some dreams. 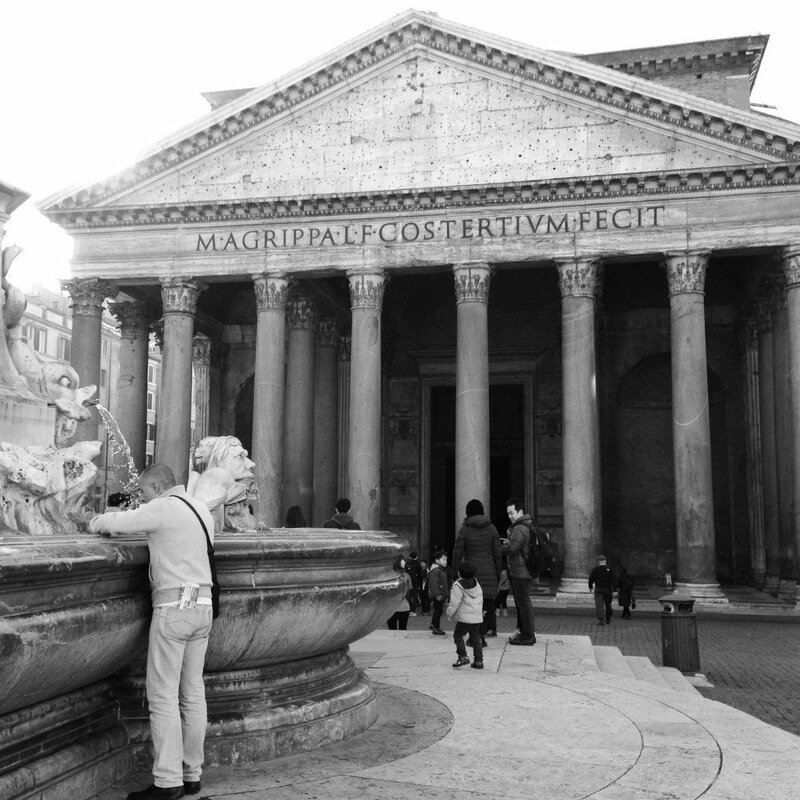 I moved to Rome, where I worked as an au pair and hopeful guidebook writer. I was still on the hook for some bills back home, so the Rome gig was unsustainable. I was poor. I returned home and shortly thereafter got a job with the Travel Channel as a Content Producer, back when that title sounded like a fancy writer and not just a term for a hack. It was the year 2000 – a new millennium! – and my yearly salary was $42,000. I was laid off after eight months due to company restructuring. It was the highest salary I have ever earned. For the next four years, I wrote by day and waited tables by night. The two Italy guidebooks I wrote and the others that I contributed to netted me about $20,000 – remember, this was over a four-year period – while I earned a modest salary serving food and drinks to DC writers, journalists, and politicos. In between all of that, I got married. In 2002, my husband took the Foreign Service exam and passed both the written and oral examinations. His training, and his diplomatic career, began a year later. As I had also earned a degree in International Relations, I took the FS exam the next time it came up and passed the written exam. On March 20, 2003, the first day of the Iraq War, I walked into a hulking government building to take my oral exam. The news was distracting, I was nervous (as I frequently am in interview situations), and I left the exam room that day with a “no.” For the next year and a half, as I worked as a temp at Fannie Mae, I stumbled upon this new thing called blogging. In August 2004, we moved to Mumbai, India, one of the busiest U.S. consulates in the world. Thanks to a staff shortage, I applied for and got a job in the consular section as a writer and website editor. Though my salary was low (in the mid–30s), my husband and I were both earning and paying into Thrift Savings plans and 401Ks. Our dollars went further in India than they had in DC, so we spent more time with friends and went out a lot. But after a while, when we started looking to the future, it seemed like a good time to have a baby. I quit my consular job in May 2006 and, at seven months pregnant, traveled back to the United States. I didn’t realize at the time that it would be the last time I would work in an office. Of course I would go back to work, I told myself. Of course I wouldn’t be one of those stay-at-home moms. The idea of not having my own money, however little, was not acceptable. We stayed in DC for eight months between the birth and our second overseas assignment – Turkey. Eight months was a good amount of time to spend with a baby and the impetus to get a job during that time didn’t make sense to either of us. I wanted to spend time with my son and it wasn’t worth getting a nanny just so I could work a temporary job. Ankara, where we lived from 2007 to 2009, was a lonelier post than Mumbai. There was a language barrier, both in everyday life and at the Embassy, where I was unqualified for most jobs because I did not speak fluent Turkish. I eventually found a contract position to edit the Embassy’s weekly community newsletter. It paid $150 per issue – $600 per month. When I wasn’t nursing or feeding or playing with a baby, I was also working on my Italy blog, which earned me a little bit of money from Adsense and banner ads. I had only just begun to network on Facebook (mostly with people I already knew), so I felt out of the loop with regards to writing and pitching publications. I blogged very little about Turkey because I was always fearful of the Turkish government cutting the cord. The Turkish government frequently banned YouTube and WordPress at the time because of the occasional Turkish blogger who slandered Ataturk or mentioned the Armenian genocide. I also didn’t write too much while I was in Turkey because I had a second child there. Upon returning to DC, I had every intention to get a full-time job. I applied and got interviews at a few places, but nowhere offered a high enough salary to justify putting two children in daycare and/or hiring help. Foreign Service officers also take a pay cut when they work in DC. That, coupled with housing payments, utilities, and the cost of living in Washington (well, just outside of it in the burbs), drove my husband to apply for one of the better paying but more intense State Department jobs. For nearly three years of the five years that we lived in DC, he left the house at 6 a.m. and sometimes did not return home until 11 p.m. Thanks to Twitter and Facebook and Linked In connections, I’ve pieced together some other writing opportunities. I wrote for Gadling ($10-$75/post) for a while, until I couldn’t keep up because of other assignments and family obligations. I did stuff for small travel outlets and a few bigger ones. I have not been the pitching or networking machine that I know some people to be; I fear as I get older that my eldest son, who is on the autism spectrum, inherited his attention deficit from me. (That is another story for another time.) But I feel like I have done the best I can do with the time that I have. My work history and family experience are unusual, but not unheard of. There are many who write who are “sponsored” by their spouses. But that doesn’t always mean that these writers are doing nothing but writing or that the financial picture is always rosy. Many of us write, not because we are kept, but because writing is the only job we are qualified to do. Almost all couples face a situation where one earns more money than the other. And there have always been marital situations in which one person’s job takes precedent. In the case of diplomats and military personnel, many spouses must forego their own career in order for the other to take the overseas assignment. Writing is one of the very few portable careers that work well with such a lifestyle. I am living in Rome again, thanks to my husband’s hard work and luck in being assigned to this post. However, not a day goes by that I don’t feel pressure (both internal and external) to get a job here. I’ve been on two interviews since arriving six months ago, one with a local tour company and one with the Embassy. I didn’t get either job, but neither paid that well anyhow. So we are still getting by on one income, a government income that is steady but by no means hefty. In truth, when we found out we were coming here, we both thought that this could finally be my breakout year. Back in Italy again, I could finally ramp up Italofile, tap into my local connections and writing network, and get lots of paid gigs or a regular assignment. But it hasn’t worked out like that. Competition is fierce and I’m still finding my niche. Plus, since I’m not getting paid to write about Italy, I’m still writing about traveling the USA because that is where the money is. To quit writing for About is a step towards being fully-sponsored by my husband. I don’t want to be in that position. I realize many will read this and scoff. Indeed, I am grateful for what I have and know, having been raised by a single mother from the age of 12, that my life could be much harder. Still I thought it’d be useful to put forth a third perspective. So much of this conflict over spousal sponsorship has reminded me of the “having it all” battles. While I personally know of several instances in which the female worker/earner is sponsoring the male writer, most of this argument has been yet another opportunity to divide women into those who work and those who stay at home. But it has also created for me another rift. For years – well, at least since I had children and stopped going to an office – I have felt marginalized, both as a mother/woman and as a travel writer. I have been made to feel that I have failed my children, either by not earning enough money to help pay into their college fund or by sitting in front of a computer on weekends, trying to make my writing deadlines, when I should be spending time with them. Or I have been made to feel like I have thrown away all of the advancements that Betty Friedan and Gloria Steinem fought for on my behalf. I’ve also felt like a lesser writer because I have not been able to commit to traveling away from home for my job or hustling night and day just to pitch stories that may not get picked up. I’m tired. Kids are tiring. Writing is tiring. This defeated feeling is tiring. Making very little money trying to do something I feel I’m good at is tiring. And that’s when I knew I needed to come home and draft this essay. I’ve told you how I write and publish. I hope to figure out how to succeed in the near future. This: “For years – well, at least since I had children and stopped going to an office – I have felt marginalized, both as a mother/woman and as a travel writer. I have been made to feel that I have failed my children, either by not earning enough money to help pay into their college fund or by sitting in front of a computer on weekends, trying to make my writing deadlines, when I should be spending time with them. Or I have been made to feel like I have thrown away all of the advancements that Betty Friedan and Gloria Steinem fought for on my behalf. I’ve also felt like a lesser writer because I have not been able to commit to traveling away from home for my job or hustling night and day just to pitch stories that may not get picked up.” Yes and yes and yes. Thank you for sharing this. “Many of us write, not because we are kept, but because writing is the only job we are qualified to do.” Thank you Melanie. Yes, me too. I think most writers with spouses that aren’t big earners fall into this in-between scrounging and sponsored category. We struggle and yet we have a little, tiny, sort of security net. I love your clear, straight forward writing here too! WOW and wow! You just kinda explained my life as I sit here in front of my laptop on a Saturday afternoon working on a “gig”, taking a deep breath because my youngest son (also with special needs) takes a nap while my husband is at drill duty and my oldest waits in another room for me to take a break so that I can drive him to a friend’s house for a sleepover. I’m tired. Some days more than others. There are those little victories here and there but overall as I contemplate where I am in my life right now, it’s no where near where I thought it’d be. I’m a bit restless but I always get that way just before a big birthday. I’m a high achiever so the fact that I’m not producing where I should be frustrates me daily. But! I keep on pushing on because I feel a breakout and at the end of the day, I know it’s within me. Either it is or back to suits and office I go. I recognize so much of my own situation here as a trailing spouse but I’ve never been brave enough to write something like this. Thanks for your honesty. Freelance highs come and go and I really believe your next one is just around the corner. But even if it’s not as soon as you’d like, you’re already succeeding. You know that, right?